Surprise, Arizona, February 22, 2010 –	Home school teacher and mother Lori Guba and USTA Central Arizona launched a QuickStart Tennis program for the Surprise Home School Network. This program was launched on February 1, 2010 at the City of Surprise Community Park. There were nearly 40 registrants for the first session of the home school QuickStart program, making this the most successful first session of any school-based program in the Greater Phoenix Area. The children range in age from 5-10 years old, and will receive on-court training using the USTA QuickStart curriculum throughout the six week session. The majority of these children are all new to the game of tennis, with no prior playing experience. Each week, the children learn a new skill during the one hour class, and then take home an activity worksheet. This take home activity highlights the skills learned in practice that week and gives them an opportunity to practice and track their progress. This allows parents with little tennis background to work with their children off the court and bring tennis back to the house. At the completion of the six week program, the players will participate in a tennis carnival held at the Surprise Tennis & Racquet Complex. There, they will be able to showcase their skills with other students from the Dysart After Schools Tennis Program. This program was started by one of the West Valley Community Tennis Association Board of Directors, Lori Guba. Lori originally began her involvement with the QuickStart tennis program as an instructor in the Washington School District After Schools Program. She immediately became one of the student’s favorite instructors and one of USTA Central Arizona’s best coaches. Lori realized the potential of such a program in the home school network and approached USTA Central Arizona about starting a program in such a setting. She decided to take advantage of “Park Day,” a day during which many kids from the Surprise Home School Network get together for some physical activity. 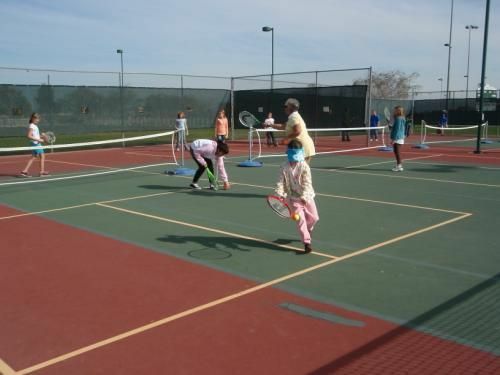 Since tennis is not currently a part of the home school physical education curriculum, the addition of QuickStart tennis to Park Day provided a new activity for both kids and parents to try. Moving forward, Lori and USTA Central Arizona would like to expand this program into other home school networks in the Greater Phoenix Area. QuickStart tennis is a new play format to help children learn how to play the game of tennis with age and size appropriate equipment. QuickStart tennis includes six specifications - including age, court size, racquet length, ball weight and speed, net height and scoring format. 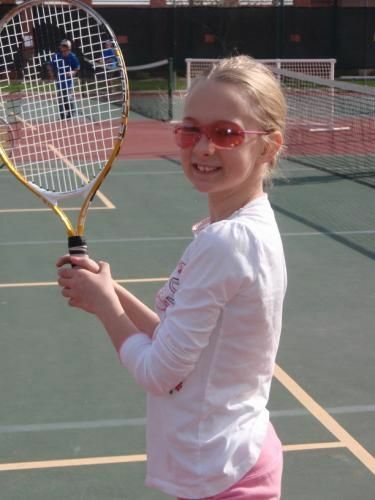 This enables youngsters to practice and play real tennis to scale, and allows them to play and learn at the same time - as opposed to the traditional model of learning skills before playing the game. Since rallying and playing is much more fun than standing in line, children will want to continue to learn the game and develop the skills necessary to play with their friends on a team. The United States Tennis Association developed the QuickStart curriculum to help make tennis more enjoyable for the kids. What makes tennis fun is being able to rally a ball back and forth over a net with a partner. The sooner the youngsters can rally, the sooner they can actually play the game and participate on a team. The curriculum was designed to give coaches and parents who work with children at the beginning stages of development the necessary tools to get children playing the game during their first practice—tools such as simple lead-up activities and ways to modify the court, net, racquets, and balls. USTA Central Arizona is the local governing body for the sport of tennis in the Greater Phoenix Area and the leader in promoting and devloping the growth of tennis at every level - from local comunities to the highest level of the professional game. A not-for-profit organization with 5,000 members, it invests 100% of its proceeds in growing the game of tennis. USTA Central Arizona provides grants and scholarships through private donations, which helps underserved youth and people with disabilities to improve academics, build character and strive for excellence. For more information on USTA Central Arizona, long on to www.phoenixtennis.com.